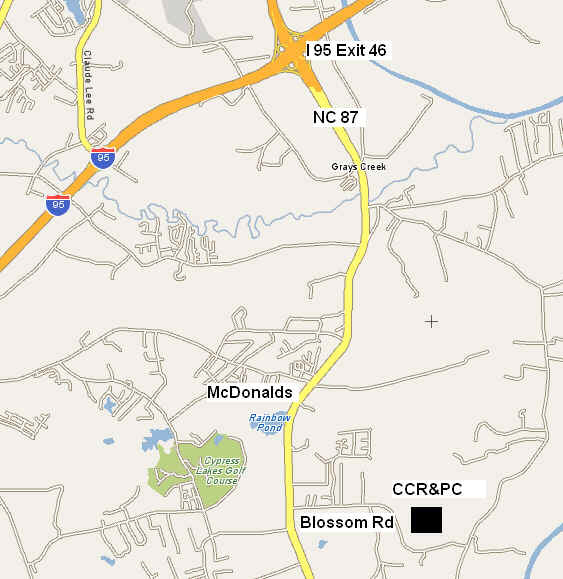 The Crosse Creek Rifle and Pistol Club range is approximately 10 miles south of Fayetteville, NC at 3229 Blossom Rd. From the intersection of NC 87 and I-95 exit 46, follow NC 87 south for approximately 4.7 miles. Watch for Blossom Road on the left about 1.1 miles past the McDonalds. Turn left and follow Blossom Road for approximately 1.2 miles. The entrance to the range is an unpaved driveway on the left. Look for a concrete marker with the number 3229.